One of the more popular things in the automobile world of late is all of the talk about Hybrid cars. A standard Hybrid automobile uses multiple motors, one powered by gasoline and one by electricity, so that neither is overloaded by demands of the functions of the vehicle. 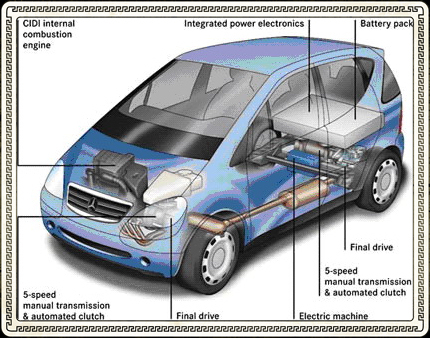 The presence of the electric motor reduces the demand on the gasoline motor, thereby improving the vehicle’s gas mileage. Hybrid cars seem to be the answer to the world’s problems regarding high fuel prices and cars that are hard on the environment. But, there are a number of things you should know about Hybrid cars. One of the things that makes Hybrid vehicles operate so effortlessly is the combination of the gasoline engine, the electrical engine, and the battery cells. The batteries store up energy and recharge themselves when the vehicle is slowing its speed, then when more power is needed the batteries shift power to the electric engine. When all of these operate in conjunction with each other, maximum efficiency of the vehicle is reached, this is where the improved gas mileage comes from. Hybrid automobiles actually perform more efficiently at lower speeds than traditional gas powered vehicles. In standard engines, when the automobile’s RPMs decrease so does the available power for the car, this is not true in Hybrid vehicles. The constant flow of power makes it so that the automobile can operate efficiently at any speed. The price of a Hybrid vehicle is usually significantly more than a standard automobile. This is mainly because of the supposed newness of the technology and that the assembly process is still being developed to it’s fullest. Like most technologies, even automotive, as the technology and process improves the price should decrease. Though the initial outlay of money for a Hybrid car is more than that of a standard car, the money can be made up later and over time when considering that less money will be spent on fuel. Other discounts are available too, for example some insurance companies offer discounts to the owners of Hybrid vehicles. There are many arguments against buying a Hybrid vehicle. Some people will say that the technology is so new that it cannot be completely tested and perfected. While there may be some improvements made over the coming years, in all actuality Hybrid technology has been around for years. The manufacturing process is new though and there will be significant improvements made. Another argument heard against Hybrid vehicles is that they are too compact. The earlier models of Hybrids included mostly compact and sub-compact cars, but lately more luxury models are being produced along with even what was once the unthinkable, Hybrid SUVs. Automobile manufacturers have come a long way in the process of bringing alternate fuel technology to the people. At first most companies seemed resistant to the public’s desire for Hybrid vehicle technology, but as time has passed most major car makers have developed at least one Hybrid vehicle and added it to their existing product line. Through the coming years we will undoubtedly see major improvements in Hybrid automobile technology. The fact that Hybrid vehicles are good for the environment, good for the wallet, and good for the future of the world mean that they are not going any where anytime soon, and that is a good thing.